A lot of the buzz leading up to Taylor Swift’s fifth album, 1989, surrounded her claim that it was a final big leap from country to pop. In reality, this sounds like a more dramatic shift than it is, since she already made that jump with her last record, Red, which forwent the usual twang for dabbles in indie pop, stadium rock and dubstep drops. The difference here, then, is more in tone. While Red was warm and playful, with a few country-lite ballads to fill in the gaps between the big singles, 1989 is all steely surfaces and icy beats, a modern pop record through and through, where feel and mood sometimes trump song. Normally, this would be a significant, even fatal, error judgement for an artist like Swift, who made her name on charming earnestness and an endearing clumsiness and relatability. There needs to be a warmth then, something the distant, robotic production of dance-pop rarely offers, in order for her approach to land effectively. And at its worst, some of that distance does harm 1989, like, say, the catchy but generic opener “Welcome To New York,” which, as agreeable as it is, sounds like anyone could have made it, when, love ’em or hate ’em, Taylor’s songs are usually unmistakably hers. But savvy star that she is, Swift already knew all this, so she pivoted 1989 in a direction that takes advantage of the style, enlisting producers to assist her in making an album full of bangers—nearly every song here is a potential single, and only “This Love” and “Clean” land into ballad territory. It helps even more that she leans into some of the darker shades of her music, bringing the previous subtext of her heartbroken confessions to the fore, even as the hooks keep on coming. Paranoia and obsession tremble throughout 1989, keeping her and her exes up at night, lingering after lost loves and sabotaging new relationships, all befitting the perspective of a woman whose dating life is constantly the subject of public scrutiny. “Style,” for instance, is all bouncy singalong and James Dean references, but is premised on a toxic, misguided relationship of two people who pretend they’re meant to be together. Elsewhere, “Wildest Dreams” finds Swift borrowing Lana Del Rey’s affected disaffection and doomed romanticism, but she cuts the pretension in half so it’s an easier sell; “I Know Places” goes as far as to deride the paparazzi and public as “hunters” and “vultures,” while she imagines an escape route out. Even the closing “Clean” (with production by Imogen Heap, nice to see you), which is ostensibly about getting over someone whose attraction has plagued you for years, uses the language of addiction (“Now that I’m clean, I’m never gonna risk it”) and sounds unsettled and unsure, far from the great exhale her words seem to promise. And though “Welcome To New York” and the incredible, buoyant first single “Shake It Off” try to deflect the demons, the overwhelming impression the album leaves is one of confusion and uncertainty. 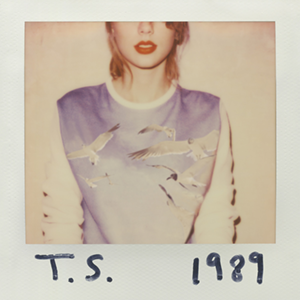 If this sounds oppressively, laughably dark, well, it’s all relative—this is still a Taylor Swift album. With the likes of blockbuster pop moguls Max Martin and Ryan Tedder behind the boards, this is immaculately candied pop, spit-shined within an inch of its life, so it never sounds too glum, and even if Swift’s lyrics suggest darkness and dysfunction, her words aren’t abrasive in and of themselves. (Case in point: this is an album that rhymes “fella over there” with “hella good hair.”) It all serves to create one of Swift’s best and most cohesive records yet, and one of the year’s finest pop records, one that goes down so easily that it makes it easy to overlook its considerable craft. The production keeps things moving even when Swift’s lyric and songwriting slip, and her words help inject some messy humanity back into the wintry layers of programming. It’s hard to say where she’ll move next, but that’s the thrilling feeling that comes with an artist in her prime. And since, as of this post, 1989 has positioned her as the only artist ever in the SoundScan-era to have three albums sell over a million records in a single week, I’d say that Taylor is certainly in her prime.